Memorial Day is an invitation to honor the men, women and families of the United States Military. 1. Celebrate with an activity that edifices the active and veteran soldiers. Remember the soldiers that gave their life for our country. This is also a time to thank the soldiers that are wounded from war. It is only by their sacrifice for our nation that allows us the freedom to celebrate. 2. 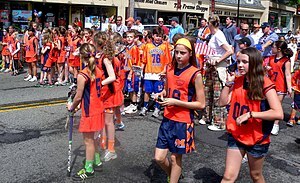 Go to a Memorial Day Parade or take part in the activities. 3. Spend the weekend at the beach. Be patriotic and wear a red swimsuit and carry fun little USA flags to stick in the sand or use as drink decoration. Surf, jet ski, and play in the ocean. but if you really want to maximize your beach weekend, host a bonfire for the evening. 4. Plan a barbecue or a picnic complete with all the red white and blue accessories. And don’t forget the “must have” red and white plaid table-cloth. 5. Get together with your favorite friends and reserve a cabin for the weekend and do whatever your heart desires. Don’t forget to pick up campfire marshmallows and try to brush up on your best ghost stories. 6. Book a riverboat tour and bring along your camera. Photo journal your excursion for a later trip down memory lane. 7. Look for a big screen Cinematique experience under the beautiful canvas of the stars and the night moon. Share the evening with someone special and bring your favorite blanket. 8. Go for an antique hunt for treasures that make you happy. Buy something you love, but you don’t need. 9. Plan to eat hotdogs and burgers prepared from the outside grill. Visit your local farmers market for the sides like fresh veggies and watermelon. 10. Attend a concert in the park. If none are scheduled, get your musical inclined friends and create one. 11. In case of rain (hush hush) – go see the summer blockbuster and eat all the combo junk food from the food court. 12. For the grand finale – Fireworks. Memorial Day weekend is not only a tribute to those who lost their lives for our country, but also to their families who suffered the loss. Do something special for them – fruit basket, book, or just a short visit. This mega weekend is also the beginning of vacation season. It’s all about the beaches and fun in the sun. Make great memories and have a Memorable weekend, no matter what you decide to do.